Bible prophecy reveals events of our time and world-shaking events soon to change your life. A major world-shaking event is foretold in the symbolic language of a mysterious, world-dominating, wild beast. Who or what is the wild "beast" of the Apocalypse, or book of Revelation, chapters 13 and 17? What does Bible prophecy reveal about world events now leading to Armageddon and the end of this age? This series of articles deals with governments and wars that will bring this world to its final end. The Bible is God's book of history, prophecy and revealed knowledge of God's purpose and master plan for humanity from its beginning on into eternity. But the Bible is primarily a book about the chosen nation of Israel, and other nations that have come into direct contact with Israel. We know little concerning nations, or whether there were nations on earth, prior to the great Flood. But soon after the Flood, Nimrod founded the city-states of Babylon, Nineveh and others. In due time such nations as Egypt, Assyria, Babylonia, the Aramean states, Israel, Phoenicia and others developed in the Middle East, By the end of the seventh century B.C. King Nebuchadnezzar had founded the first world empire or union of nations. The Bible does reveal the history, and prophecy from now of the system of gentile world empires starting with Nebuchadnezzar's Babylon on to the Second Coming of Christ, as well as the history and yet future prophecy concerning Israel. This series of articles will cover the true significance of these two systems of nations, and what it means to us today, as well as what is prophesied for the imminent future. First, then, who or what is the mysterious wild beast of Revelation 13 and 17? If you have his mark, you must suffer the seven last PLAGUES! Is he a mysterious superman world dictator yet to appear? Is he the antichrist-or a government-or a church? THE MOST important question of the hour is, What, or who, is the BEAST, the IMAGE of the beast and the MARK of the beast spoken of in the Apocalypse, or book of Revelation? Whatever this weird beast -whatever the baffling image-whatever the mysterious mark-it behooves you to find out! For it is those of this very present generation who shall be worshiping this beast or his image, or shall have received his mark, who will suffer the unspeakable torture of the seven last plagues! Ignorance will not excuse! "My people are destroyed for lack of knowledge," says the Eternal, in Hosea 4:6. And the illustration of Ezekiel's watchman shows that those who are unaware because they are not warned will suffer just the same (Ezekiel 33:6, 3:18). God expects the spiritual leader of His people to be His "watchman" (Ezekiel 33:7) and to warn the people. The time is at hand! The plagues of God's wrath will soon be poured out, unmixed and undiluted-full strength- upon a heedless, God-defying world, and a careless, lukewarm, indifferent Christianity! Listen! 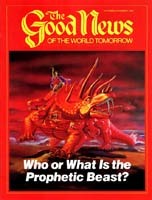 John in the Apocalypse, or book of Revelation, describes the last warning message: "If any man worship the beast and his image, and receive his mark in his forehead, or in his hand, the same shall drink of the wine of the wrath of God, which is poured out without mixture" (Revelation 14:9-10). This amazing prophecy is most significant, because it is revealing in advance events immediately ahead of us at this present time. Listen again! John, carried forward in vision into the terrible "day of the Lord," sees these plagues beginning to fall! "And the seven angels came out of the temple, having the seven last plagues … and the first went, and poured out his vial upon the earth; and there fell a noisome and grievous sore upon the men which had the mark of the beast, and upon them which worshipped his image" (Revelation 15:6, 16:2)! Those who suffer the wrath of almighty God are described as those who worship the beast or his image, or have his mark. It is futile to try to imagine, as so many are doing, what the mark of the beast may be. These prophecies are real. They are imminent. Because these and other prophecies have never been understood until now, even churches, theologians, evangelists have been ignoring prophecies in general and these imminent prophecies in particular. Too many are trying to speculate in their imaginations. But God says, "My thoughts are not your thoughts" (Isaiah 55:8). Notice carefully this Bible description. The apostle John was being given this message for you and me of this day. In the vision he saw "a beast rise up out of the sea, having seven heads and ten horns, and upon his horns ten crowns, and upon his heads the name of blasphemy. And the beast which I saw was like unto a leopard, and his feet were as the feet of a bear, and his mouth as the mouth of a lion: and the dragon gave him his power, and his seat, and great authority" (Revelation 13:1-2). If the beast is some mysterious superman, or antichrist, soon to appear as world dictator, he will be a peculiar-looking individual indeed, for he will have seven heads, and ten horns! Have you ever seen a man with seven heads, and 10 horns growing out of one of his heads? And did you ever see a man who was like a leopard, and can you imagine a superman coming who will have the feet of a bear, and the mouth of a lion? And will he appear by coming up out of some ocean? Now these, of course, are all symbols. The very word beast is a symbol. And our problem is to interpret the symbols, for they stand for real, literal things. But man cannot interpret biblical symbols. And when we know what the heads and the horns are, what the feet of the bear, the mouth of the lion and likeness to a leopard all mean, then we can know what, or who, the beast really is! The point we want to stress is that the Bible interprets its own symbols! If we want the truth, we must be guided solely by the Bible interpretation, not man's interpretations and imaginations. In the seventh chapter of Daniel, we find exactly these same symbols described. Here again are the beasts, the seven heads, the 10 horns, and here also is the lion, the bear and the leopard. And here the Bible tells us what these symbols represent. God had given Daniel understanding in dreams and visions (Daniel 1:17). And Daniel had a dream and a vision (Daniel 7:1) in which he saw four great beasts (verse 3). And notice, as in Revelation, the beasts came up out of the sea. The first was like a "lion" (verse 4), the second was like a "bear" (verse 5), the third like a "leopard" (verse 6) and the fourth was so dreadful and terrible it could not be compared to any wild beast known to inhabit the earth (verse 7)! Now there was only one head described on the lion, one for the bear, one for the fourth beast-but the third beast, the leopard, had four heads-thus making seven heads in all! And out of this great and dreadful fourth beast grew 10 horns! Now notice verse 16, latter part. Here comes the interpretation of the things! The question is, Will we accept this Bible interpretation of the seven heads, the 10 horns, the lion, the bear and the leopard? "These great beasts, which are four, are four kings, which shall arise out of the earth," is the interpretation of verse 17. And the word king is synonymous with kingdom, and used only in the sense that the king represents the kingdom over which he rules, for in verse 23 we read, "The fourth beast shall be the fourth kingdom upon earth." Notice also the word kingdom is used to explain the beasts in verses 18, 22, 24 and 27. Now what do the 10 "horns" represent? Notice verse 24: "And the ten horns out of this kingdom are ten kings that shall arise." Notice the 10 horns, or 10 succeeding kingdoms or governments, come OUT OF A KINGDOM, not out of a man, or a superman. This alone makes plain that the beast is not some mysterious personal superman yet to come. Also that the beast is not a church as some claim, for no 10 kingdoms ever did, or will, come out of a church. And since "king" in these prophecies only stands for the kingdom he represents, and since the words are used interchangeably, it follows that these 10 horns are 10 succeeding kingdoms growing out of the fourth kingdom, which was to rule the earth! The dream is described in verses 31-35. The king saw a great image. Its head was of gold, its breast and arms of silver, its belly and thighs of brass, its legs of iron and its feet and toes were part iron and part clay. Finally, a stone, not in men's hands, but supernaturally, smote the image upon his feet and toes. It was broken in pieces and was blown away like chaff. Then the stone that smashed it became a great mountain and filled the earth. "This," Daniel says, beginning verse 36, "is the dream; and we will tell the interpretation thereof before the king… . Thou art this head of gold. And after thee shall arise another kingdom inferior to thee, and another third kingdom of brass, which shall bear rule over all the earth. And the fourth kingdom shall be strong as iron: forasmuch as iron breaketh in pieces and subdueth all things: and as iron that breaketh all these, shall it break in pieces and bruise" (verses 36-40). The interpretation of the stone smashing the image at its toes is found in the 44th verse: "And in the days of these kings shall the God of heaven set up a kingdom, which shall never be destroyed: and the kingdom shall not be left to other people, but it shall break in pieces and consume all these kingdoms, and it shall stand forever." The stone is Christ and His world-ruling Kingdom. The interpretation of the stone is given many places in the Bible. "Jesus Christ of Nazareth … is the stone which was set at nought of you builders, which is become the head of the corner" (Acts 4:10-11). And so we see that here are portrayed, symbolically, four universal world-ruling gentile kingdoms. They begin with the Chaldean Empire, which took the Jews captive to Babylon. God had promised ancient Israel that if they would keep His commandments, be His obedient nation, they would grow into a multitude of nations-or an empire-that would dominate the entire earth. But for disobedience they were to be taken captive by gentile nations (Leviticus 26 and other prophecies). Ancient Israel had been tried through the generations and centuries. They had disobeyed. Now they had been taken captive by Nebuchadnezzar, who had raised up the world's first empire. But as God revealed through Daniel in chapter 2, it was God who had turned this world empire over to this succession of gentile empires. They continue through four great universal kingdoms, and out of the fourth grow 10 succeeding governments. These carry to the time of the Second Coming of Christ and the setting up of the Kingdom of God to fill the whole earth and last forever. The second kingdom, which followed, then, we know from history, was the Persian Empire, 558-330 B.C., often called Medo-Persia, composed of Medes and Persians. And the FOURTH KINGDOM, which, developing from Rome, spread out and gradually absorbed one after another of these four divisions -"dreadful and terrible, and strong exceedingly," was the ROMAN EMPIRE (31 B.C. to A.D. 476). It had absorbed all the others, occupied all their territory, was greater and stronger than all. It included all the royal splendor of ancient Babylon, thus having the head-the strongest part-of the lion. It had all the massiveness and numerically powerful army of the Persian Empire-symbolized by the legs, the most powerful part of the bear. It was the greatest war-making machine the world had ever seen, and it also possessed the swiftness, the cunning, the cruelty of Alexander's army, symbolized by the leopard. And so John, in Revelation 13, sees, not four beasts, but one beast. Not a leopard, but like a leopard-possessing all its cunning, cruelty and speed. But it also possessed the dominant characteristics of the two other most powerful beasts-the feet of a bear, and the mouth of a lion. Daniel's fourth beast, the Roman Empire, had absorbed and therefore it included the three beasts before it. Thus it included all seven heads. And John's beast also has seven heads. It was Daniel's fourth beast, only, which had 10 horns and John's beast has 10 horns. And so, if we are willing to be guided solely by the Bible description of this beast and to let the Bible interpret the symbols used to describe it, we come to the inevitable conclusion that the beast of Revelation 13 is the Roman Empire, of 31 B.C. to A.D. 476! Of course, many man-imagined theories, widely taught and published, interpret this beast otherwise-some as a church, some as a mysterious, individual superman yet to come. But these theories will not stand the test of applying the Bible interpretation to all the symbols that describe this beast. Nebuchadnezzar's image, by the two legs, describes the two divisions of the Roman Empire after A.D. 330-West, with capital at Rome, and East, with capital at Constantinople. John also pictures this beast, not as a church or as an individual man, but as a powerful government having a great army. For they worshiped the beast by saying, "Who is able to make war with him?" (Revelation 13:4). The 10 horns symbolize the same thing-the 10 stages of government continuing out of the Roman Empire after its fall, A.D. 476. The ten horns "out of this kingdom [the fourth-the Roman empire, 31 B.C. to A.D. 476] are ten kings that shall arise … and the kingdom and dominion, and the greatness of the kingdom under the whole heaven [not in heaven], shall be given to the people of the saints of the most High" (Daniel 7:24, 27). The 10 horns, then, are 10 kingdoms to arise out of the fourth kingdom, the Roman Empire. These kings, also called kingdoms, continue from A.D. 476 until the time when the stone-Christ and His Kingdom-smashes the image on its toes, and the kingdom is given to the saints. Therefore, since in actual history there have never been 10 contemporaneous kingdoms that have continued out of the Roman Empire, side by side, down to the present time-and since there have been nine successive kingdoms ruling that territory, which we shall explain, from 476 to the present, therefore we know that the kingdoms represented by the horns are successive, not contemporaneous. "And I saw one of his heads as it were wounded to death; and his deadly wound was healed: and all the world wondered after the beast. And they worshipped the dragon which gave power unto the beast: and they worshipped the beast, saying, Who is like unto the beast? Who is able to make war with him? And there was given unto him a mouth speaking great things and blasphemies; and power was given unto him to continue forty and two months" (Revelation 13:3-5). The beast here symbolized is the one that included the royal splendor and kingly power symbolized by the mouth of the lion (Babylon); the ponderous strength symbolized by the feet of the bear (Medo-Persia); and the speed, cunning and cruelty of the leopard (Greece). Since the interpretation of these symbols is found in Daniel 7, and since the fourth beast had 10 horns, the Bible interpretation of the beast of Revelation 13 is the fourth beast of Daniel 7 -the Roman Empire, of 31 B.C. to A.D. 476. The beast described by John in Revelation 13 included seven heads, but the only head existing at the time John saw this nondescript beast (which included the most powerful characteristics of all the beasts symbolizing its predecessors) was that of the fourth beast of Daniel, containing the seventh head, and also the 10 horns. So the specific "one of its heads" that was wounded to death (Revelation 13:3) was the seventh head of the Roman Empire -the head out of which 10 horns grew. The 10 horns, as Daniel interprets, represent 10 successive governments out of the Roman Empire, which were to continue until the setting up of the Kingdom of God at the Second Coming of Christ. Notice, the dragon gave his power to the beast. Who is the dragon? Some have said "pagan Rome." But will we be guided solely by the Bible interpretation of its own symbols? Then, if we will, the dragon is a symbol that means Satan the devil. Notice Revelation 12: "The great dragon … that old serpent, called the Devil, and Satan … was cast out into the earth … the devil is come down unto you, having great wrath … and when the dragon saw that he was cast unto the earth …" (verses 9, 12-13). "And he laid hold on the dragon, that old serpent, which is the Devil, and Satan" (Revelation 20:2). They worshiped the beast (Revelation 13:4). Therefore some conclude, from this one statement alone, that the beast must be the papacy, not knowing that the people worshiped the Roman Empire and its emperors! Notice how they worshiped the beast-saying, "Who is able to make war with him?" The Roman Empire was the greatest war-making power the world had ever known. This beast killed by the sword (verse 10). "The worship of the emperor: In a word, the Roman government was not only wonderfully organized … everyone was required to join in the worship of the emperor because he stood for the majesty and glory of the dominion … all were obliged, as good citizens, to join in the official sacrifices to the head of the state, as a god." But when the seventh head of this great beast received its deadly wound in A.D. 476, was that the end? No, the prophecy says "his deadly wound was healed … and power was given unto him to continue forty and two months" (verses 3, 5). The 10 horns represent 10 successive kingdoms to follow out of this kingdom. So, through the 10 horns growing out of this head (the Roman Empire of 31 B.C.-A.D. 476), the beast (for the 10 horns are part of the beast) continues until the Second Coming of Christ. The text says one of his heads was wounded to death. The beast included the seven heads and the 10 horns. John sees the beast living in the days of its seventh head, the Roman Empire. And when that head of the beast had its deadly wound, his-the beast's-deadly wound was healed. The horns now reign, one by one. The Roman Empire in northern Africa was overrun by the Vandals, who sacked Rome in 455. Then in 476 Odoacer set up his government at Rome, called the Heruli. But it did not heal the deadly wound, for this was only a government in Rome. It was not a Roman government, but one of foreign barbarians. Then there was the kingdom of the Ostrogoths, 493-554, another foreign people who ruled in the territory. But they were driven out of Italy and disappeared. Now Daniel saw a "little horn" coming up among these 10, before whom these first three were "plucked up by the roots" (Daniel 7:8). That leaves 7 horns to come. And of the little horn, Daniel 7 says his "look was more stout than his fellows" (verse 20). The papacy dominated completely all the horns to follow. It was the fourth kingdom (symbolized by the fourth horn), succeeding the fall of the Empire in 476, which really HEALED the deadly wound, and restored the empire. In A.D. 554, Justinian, emperor of the East, from Constantinople, set up his government through an Imperial Legate at Ravenna, Italy, and brought about what is known in history as the "Imperial Restoration" of the Empire. Now, notice verse 5 of Revelation 13. Power was given to this beast, once healed, to "CONTINUE FORTY AND TWO MONTHS." In the prophecies pertaining to the times of Israel's punishment, each day represents a year in the fulfillment (Ezekiel 4:4-6, Numbers 14:34). Thus, the healed beast is to continue 1,260 years. Following the healing, in 554, came the Frankish kingdom (French), the Holy Roman Empire (German, then the Austrian Habsburgs) and Napoleon's kingdom (French). But when Napoleon was crushed in 1814, the healed beast continued no longer. "So closed," says West's Modern History, page 337, "a government that dated from Augustus Caesar [from 31 B.C.]." It went into abyss! And from 554 to 1814, the duration of the "healed beast," was exactly 1,260 years! At that time, eight of the horns having appeared and gone, the beast itself went into the nonexistent condition symbolized in Revelation 17:8 as the "bottomless pit." But by the year 1870, Garibaldi had united the many little divisions in the peninsula of Italy into one nation, and the kingdom thus established began the ninth horn, which culminated in the Fascist rule of Mussolini. We shall deal later more specifically with the 17th chapter of Revelation in this connection. But let us note in passing that the woman mentioned in this chapter never rode on any part of this beast of Revelation 13 except its last seven horns! She is the "little horn" of Daniel 7, whose "look was more stout than his fellows," and who caused the first three to be plucked up by the roots. And since, in the 17th chapter of Revelation, the woman rode on all seven of the heads of the beast there pictured, and since she rode none of the heads but only the last seven of the horns of the beast of Revelation 13, it follows that the seven horns of the "healed beast" of the 13th chapter form the seven heads of the beast of the 17th chapter! Notice, at the time John saw the beast, five are fallen, one is and one is yet to come (Revelation 17:10). The five that are fallen are the five during the 1,260 years in which power was given, by religious authority, for the healed beast to continue. The one that "is," is the kingdom that extended from Garibaldi to the downfall of Mussolini. It was not in any sense the power-wielding old Roman Empire, so during the stage of this ninth horn (Revelation 13) or sixth head (Revelation 17) John speaks of it as the beast that was, and is not, and shall arise once more out of the bottomless pit. The seventh head with its 10 horns, in the 17th chapter of Revelation, will be, as the 17th chapter explains, the revival of the beast, the Roman Empire, "out of the bottomless pit" by a "United States of Europe," or federation of 10 European nations centered within the bounds of the old Roman Empire (Revelation 17:12-18).